From San Francisco to Bhutan, hoteliers are opening new properties that offer everything from on-site fashion shows to wellness spas to a prayer pavilion. Richard Branson comes to San Francisco, Rosewood raises the luxury stakes in Hong Kong, Nobu makes its long-awaited debut in Cabo San Lucas and the Shinola empire continues its brand extension in Detroit. These are among the more intriguing hotel openings scheduled for the end of 2018 and the first half of 2019. Virgin Hotels San Francisco The second location of Richard Branson’s Virgin Hotels (the first is in Chicago), this 196-room property, opening in December, is situated near Yerba Buena Gardens and the new Central Subway station, which is scheduled to open in 2019. It will have multiple dining and drinking outlets — including the brand’s flagship space, Commons Club, which hosts events such as fashion shows and lectures — and one of the few rooftop bars in the city. Virgin has plans to open several more locations in the United States in the next several years, including in Nashville and Miami. Nightly rates from $215. Rosewood Hong Kong Hong Kong has no short supply of luxury hotels, but this 413-room property, scheduled to open in March, is one of the few in the heart of Victoria Dockside, a blossoming food, art and design district on the Tsim Sha Tsui waterfront. Nightly rates from $540. The Fife Arms This hotel, set in the village of Braemar, Scotland, a few miles from Balmoral Castle, and scheduled to open in December, was once a 19th century hunting lodge for the Duke of Fife. Recently restored by the Swiss art power couple Iwan and Manuel Wirth, the Fife Arms has 46 rooms, contemporary interiors designed by Russell Sage and a collection of world-class art, including new commissions from leading international artists. Nightly rates from 250 pounds, including breakfast. Belmond Cadogan, Situated in the neighborhood of Chelsea, and once a stopping point for both the famed actress Lillie Langtry and the playwright Oscar Wilde, this 1887 property is scheduled to open in December after a three-year, $48-million restoration. The 54-room hotel is made up of five adjoining townhouses with many of the original design details (working fireplaces, mosaic floors and wood paneling) kept intact. Guests have access to the square’s private garden. Nightly rates from 470 pounds. NoMad Las Vegas A hotel within a hotel, the NoMad Las Vegas, which is scheduled to open on Nov. 14, is situated in the recently opened Park MGM and has Art Deco- inspired interiors designed by Jacques Garcia. The 293 rooms have oak hardwood floors, beds with leather headboards, original vintage artwork and minibars that were constructed from steamer trunks. Nightly rates from $199. 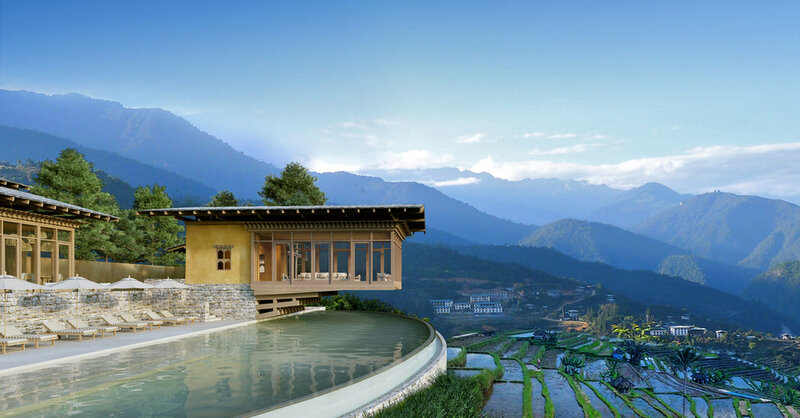 Six Senses Bhutan Six Senses comes to the kingdom of Bhutan with five lodges set in the western and central valleys of the country. Three — Thimphu, Paro and Punakha — will open in November while the other two — Bumthang and Gangtey — will open in March 2019. In total, there will be 82 rooms and each lodge offers its own activities. In Punakha, for example, guests can meditate at a prayer pavilion overlooking the giant Buddha statue across the valley and go on hikes; in Paro, they can have a private dinner in the middle of 15th century stone ruins. Nightly rates from $1,500, all inclusive. The Hoxton, Chicago A growing chain with global ambitions that’s already a huge hit in its home base of London, the Hoxton, Chicago, scheduled for a spring opening, is being constructed in Fulton Market on a site that was formerly home to a car maker and meatpacker. It’s the brand’s third United States outpost (the others are in Williamsburg and Portland, Ore.) along with branches in Paris and Amsterdam. The 175-room Chicago property will be home to a still-unnamed restaurant and bar, a rooftop pool that’s open to the public and lively public spaces. Guests will get free Wi-Fi and one hour of free international calls. Nightly rates are still being determined and will include breakfast. Nobu Los Cabos Robert DeNiro’s and chef Nobu Matsuhi’s fast growing hotel collection is finally expected to make its Mexico debut in the summer of 2019, after first being announced for 2018. The Japanese-beach-house-style property will have 200 rooms, all with ocean views and an aesthetic that’s a combination of contemporary Japanese minimalism and touches from Mexico (think wood-soaking tubs, shoji-inspired closet doors and Japanese lanterns). On site will also be a branch of the Nobu restaurant and a farm-to-table restaurant called Malibu Farm, as well as an Asian-influenced spa. Nobu Hotels is also scheduled to open a location in Riyadh next year, though recent events involving Saudi Arabia may complicate that development Nightly rates still being determined. Shinola Hotel The revitalization of downtown Detroit continues with a partnership between the luxury watchmaker Shinola and the real estate firm Bedrock, two local brands that have invested deeply in the city in the past few years. They are now teaming up for the first Shinola Hotel, located in the downtown shopping district, scheduled to open in December. The property, which joins two recent addition to downtown Detroit — the hipster hangout of the Foundation Hotel and the formerly private Detroit Club — is a combination of two restored buildings, the former T.B. Rayl & Co. department store and a former Singer sewing-machine store. It will have 129 rooms, a food and drinks program from New York City chef Andrew Carmellini and an outdoor beer hall. Most of the furniture and other décor was produced in the United States and minibars are stocked with beers produced by Michigan breweries. Library Street Collective, a Detroit gallery, is curating the art for the property and plans to showcase a combination of international and local artists. Nightly rates from $195.